Here is a photograph of a door storage / organizer I made a while back. My son at the time had a jungle themed bedroom. I would buy all kinds of material that had jungle animals on or animal prints. I saw this fabric in a store and thought it would be great in his room. I bought two metres and took it home to decide where about I would utilise this. Then I came up with the idea storage pockets, as the material already looked like pockets because of the square theme. Firstly, I cut the size I needed for the main part and then used the spare material to then cut out matching pockets. By this, I mean, cutting out a large square with the elephant on and then placing this pocket over the elephant on the main material. I then sewed two loops using the same material, and hooked these onto the hooks I had placed in the door specifically for this organizer. This was ideal to put in his toys and books. He no longer has a jungle bedroom, however even though the room has a different theme, this door organizer is still hanging up on the door as it always comes in useful for all the clutter. Fortunately, the door is kept open with the organizer against the wall so nobody really sees this, unless they go in the room and close the door behind them! This project did not take very long to do, I would say a couple of hours, if you are a quick worker then maybe quicker. The time consuming part was the ironing of the pocket hems and pinning them onto the main sheet! The sewing part was pretty quick. 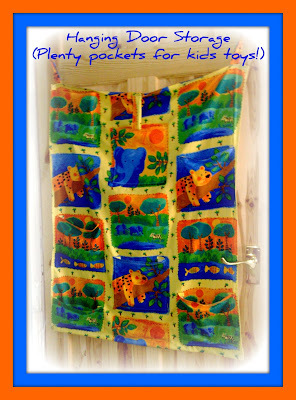 A door organiser can be very useful and can also be a way to use up some of your different fabrics. You could have all the pockets in different fabrics and sizes and make it very individual.